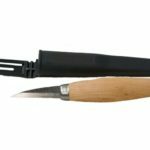 This is a finely-crafted knife from the Sweden makers at Morakniv, and an excellent choice for anyone in the market for a laminated steel blade tool. 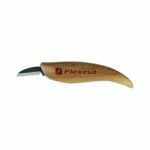 The feeling of the oiled handle along with the sharp edge are ideal for whittling. 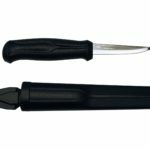 The mora 105 knife is razor-sharp out of the box, and is easily sharpened with a strop or a barber’s stone. The oiled birch wood handle gleams and stays shiny even after continued use, and its size is ideal for jobs like cedar shakes, bowls, or spoons. Though many may assume that its longer handle would make intricate cuts more difficult, the lightweight birch is good for detailed carving projects. In many ways, this knife mirrors the best advantages of much pricier options from Swiss and German manufacturers, making this a great mass-produced, more price-friendly alternative. Like most knives of its class, the mora 105 doesn’t come with a sheath or cap, but this could be a disadvantage to some who are worried about the safety of its extreme sharpness. This knife could also benefit from a sheath since the fragile edge is subject to nicks. 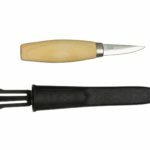 Though most people enjoy the shape of the mora 105, some could find the tapered shape displeasing and may want to alter it. The oiled finish may be too slippery for some, so the handle may benefit from some light sanding – and some users find that they need to reconfigure its shape. 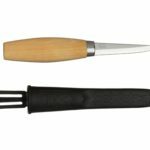 Though the sharpness of the blade and the versatility of the kinds of cuts this knife can handle make it attractive to many carvers, many find the handle shape needs to be altered for prolonged use. For anyone who wants to try their hand at making their own knife handles, consider purchasing the Morakniv No.106 Blade.